Residents came to shake hands, share food and build new friendships in their neighborhoods Tuesday night, banding together with their Neighborhood Watch Groups to host “National Night Out” block parties throughout the city. At West and 42nd Street, neighbors fired a barbeque grill and swapped stories as children waited in line to jump in a bounce house. Live jazz filled the night. “We called our band FNABT short for Friday Night at Bruce Tyrone. That’s because we would go to his house and play,” said Earl Rhue, 64, whose music filled the streets. On another block, a dance party was in full swing. “I think we were successful in breaking the ice, so neighbors could start talking to each other,” said Tanya Nesbitt, 40, and an organizer of neighborhood watch activities. 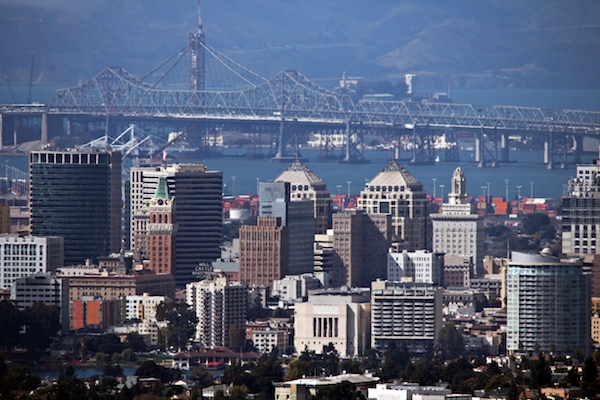 Some 654 parties were registered for the event’s 30th anniversary in Oakland. This increased slightly from 600 in 2012. More than 34 million people from more than 10,000 communities participate in “National Night Out,” according to a press release. For one resident who moved to Temescal from East Germany last Christmas, the cookout was a plus. “It’s good to have a block party where neighbors come together. I bought here in estimation of the value coming up. I realized there is no need for it to come up. It is already up. A sign of a good community is the connection that you have with the people around you. I made an effort today. I know my neighbors by name. There is something to be said about that. By knowing them, and them knowing me. It makes my neighborhood safer. It makes a difference, “ said Hannes Muesch, 45. On National Night Out, block parties throughout Oakland brought together neighbors. A rented bounce house delighted the children.